NOTE: Traxxas VXL Brushless models are 3S/2S LiPo compatible; XL-5 Brushed models are only 2S LiPo compatible! Keep this in mind when choosing a battery for your Traxxas model. 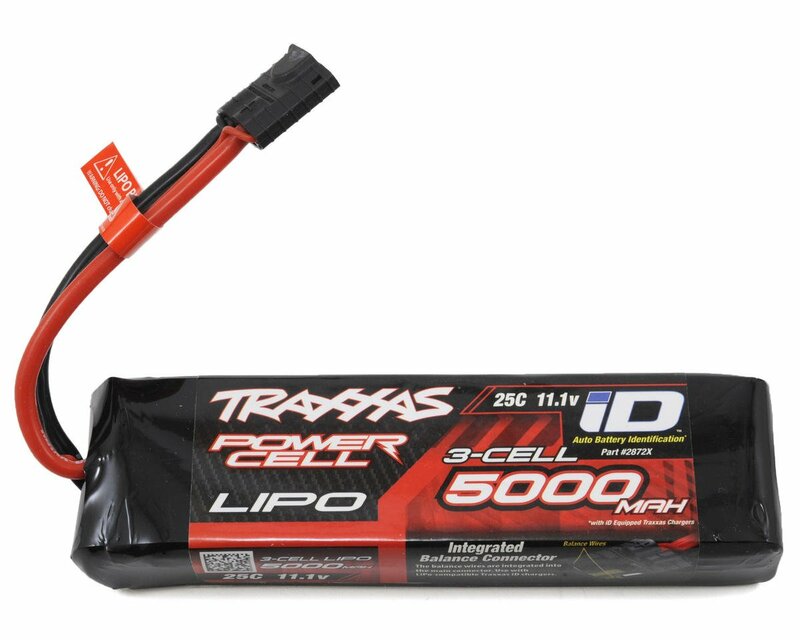 This is the Traxxas 3S, 11.1V, 5000mAh, 25C "Power Cell" Li-Poly Battery Pack with iD Traxxas Connector. This battery requires a Traxxas iD equipped LiPo charger to balance-charge! All Traxxas iD Power Cell Battery Packs are optimized for free-flowing power and maximum punch with premium quality, low-resistance cells; flexible, silicone-jacketed 12-gauge wire; heavy-duty welded tabs; and patented Traxxas' high-output, gold plated, High-Current Connectors. Revolutionary concepts come in all shapes and sizes, and the patented Traxxas High-Current Connector defines the new standard for efficiency, ease of use, and high-current handling. On iD-equipped Traxxas LiPo batteries, the balance connectors are integrated into the Traxxas High-Current Connector eliminating fragile balance wires and connectors, along with the need for external balance boards. The Traxxas iD battery system is the easiest and safest way to charge your Traxxas batteries. The EZ-Peak Plus (TRA2970) recognizes Traxxas iD batteries and in an instant automatically configures and optimizes the charger settings. There's no need to be a battery expert or learn how to navigate complex menus. Just plug in a Traxxas iD battery and EZ-Peak Plus does all the work for you. Semi-Rigid Construction: Traxxas Power Cell LiPO packs use a unique construction method that results in a firm, rugged, and compact pack that does not require a hard case. This allows Power Cell LiPo's to offer greater capacity in a given size, and also allows the user to easily monitor the condition of their battery. Unlike a hard-cased pack, if a Power Cell LiPo "puffs" or softens due to damage or abuse, the user can easily see and feel the change in the pack. Plus, there are no wire harness connectors that can loosen and fail over time. Oversized Discharge Tabs: Power Cell LiPo's are constructed of premium cells with extra-wide discharge tabs. The discharge tabs are the actual contact points between the cells, so maximizing their surface area is critical to maximize pack performance. Power Cell LiPOs' extra-wide tabs ensure minimum resistance so more power and capacity is delivered on every run. Hard-Wired for Maximum Durability and Performance: Power Cell LiPo packs feature High Current Connectors with 12-gauge Maxx Cable wire, soldered directly to the LiPo cells. Bullet connectors found on other packs introduce additional connections, increase resistance, and allow accidental reversed-polarity connections. Power Cell LiPo's rugged, hard-wired connection minimizes resistance to make sure all the power from your battery is used for greater speed and longer run times. Maxx Cable: Every component of a battery pack contributes to its performance—and that includes the wires. Traxxas Maxx® Cable's 12AWG multi-strand wire offers extremely low resistance so power is not wasted as heat, and the fine strands allow excellent flexibility for easy installation and reduced stress on the pack's solder joints. Soft, silicone insulation protects against shorting without compromising flexibility. Maxx Cable is simply the finest and most efficient wire available, and the only wire good enough for Traxxas Power Cell battery packs. Center Wire Exit: Traxxas LiPo packs have a center wire exit to properly fit Traxxas models with wire reliefs in the chassis. You get perfect battery fit without crushed wires or cut insulation—that means longer life for your LiPo battery. 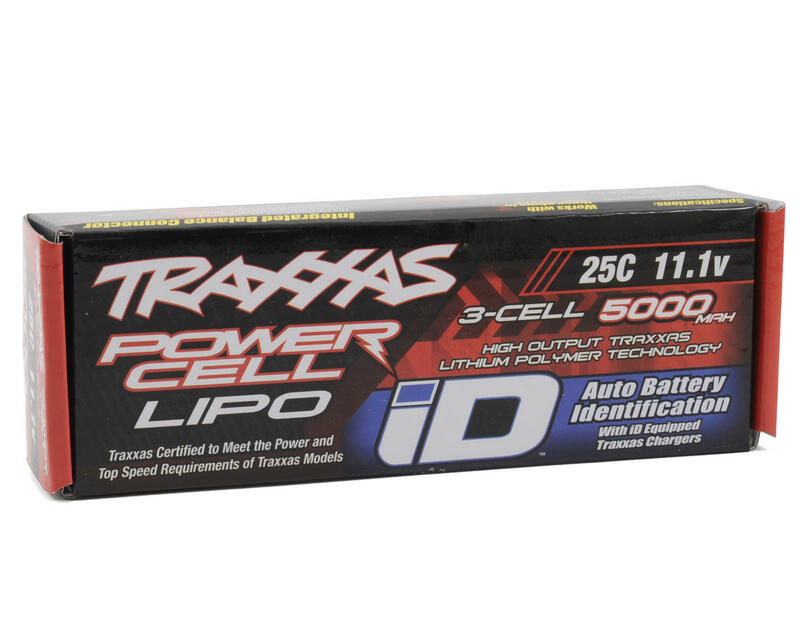 Factory Fit: Traxxas Power Cell LiPo's are designed to fit Traxxas models so you get the most capacity possible. Forget the foam blocks! Special "7-Cell" sized pack configurations maximize the capacity in your Slash, Slash 4x4 and other Traxxas models. The wires exit from the center of the pack to line up with the relief channels in Traxxas' chassis for a pinch-free fit. There are packs for every Traxxas vehicle, each guaranteed to fit properly and deliver the performance built into our models. Lifetime Battery Exchange Program: Traxxas stands by Power Cell LiPo batteries with the best warranty and exchange program available. For the first year of ownership, Traxxas will replace any battery found to be defective at no cost. After one year, any Power Cell LiPo battery in any condition can be exchanged for a new equivalent battery for just 50% of the new pack's list price, no questions asked! CHARGING NOTE: This battery can only be safely charged with a Traxxas iD Battery Charger. NEVER, UNDER ANY CIRCUMSTANCES, charge this battery using a non Traxxas iD Battery Charger. TRAXXAS STATES THIS BATTERY HAS A WARRANTY. They say they wont warranty any battery that puffs because that is due to overcharging or undercharging. That's also false because a battery that isnt sufficent enough in amp draw can easily swell and damage from being hooked up to a system that draws alot of amps " mamba monster"
I had this happen and the batteries were only 90 days old. They told me they would give 50% off retail for the issue. Thing is traxxas sells the battery for $74.99 and they want to charge you $100.00 a piece minus the 50% off when they warranty them out. Yes thats right " We will replace any battery found to be defective in the first year free of charge" Not for me or as I have found alot of other poeple they want you to pay 50% off THERE MAGICAL PRICE. I could buy the battery for cheaper than they are warrantying me. 16 of 17 customers found this review helpful. I like it. Connects easy, my kids can charge their own batteries and I've run about 10 cycles through them and see no damage. 7 of 9 customers found this review helpful. This battery is great, my slash gained a crud load of run time(45)mins and I’m going hard the whole time. I waited about 30 mins before recharging the battery because people were saying it puffs up. It did and I was very disappointed. Battery was great until it screwed itself. There goes money down the drain.